Robert Lindsay continues to be the go-to guy for updates on Bigfoot DNA news. In particular, he takes a pulse on the current status of Melba Ketchum Study/Erickson Project. Below is an excerpt from his post, "Bigfoot News January 25, 2012"
Apparent photos of a real Bigfoot examining and then licking a trail cam revealed. First DNA proven photo of a Bigfoot ever revealed! In the summer of 2009, a Bigfoot apparently approached an Olympic Project trailcam, examined it, and then licked the camera, leaving a large amount of saliva. The OP retrieved the saliva, stored it and sent it in Ketchum’s DNA project. A source has just informed us that this saliva sample from a Bigfoot licking a camera tested presumptive for Bigfoot by Ketchum. We then went back to the Olympic Project and searched for photos of a Bigfoot examining a camera. We found this set of photos that we believe represents photos of the Bigfoot that licked the camera and left the Bigfoot-positive DNA on the camera. So the photo above is apparently of a Bigfoot 100% proven by DNA. This would be possibly the second photo of a proven Bigfoot. The Matilda the Sleeping Bigfoot photo is from a site where positive Bigfoot DNA evidence was obtained, but we do not know if that evidence included Matilda or not. A photo of a Bigfoot looking at a camera on the Olympic Peninsula in Washington state. This is apparently the first photo of a DNA-proven Bigfoot ever released. The photo above was taken by the Olympic Project. A few Bigfoot footprints had been found in the area before the camera trap was set. Apparently the Bigfoot started licking the camera soon after the photo above was taken. Photo taken July 25, 2009 at 4:23-07-23 AM on the east slope of the Olympic Mountains. 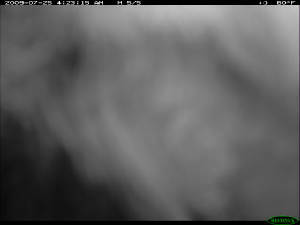 The Bigfoot apparently approached and then licked the camera for 16 seconds. The camera was a Reconyx RC60 trailcam. When the team returned to the site to retrieve the film on August 22, 2009, they found that the camera had been moved about four inches, apparently by the Bigfoot. In the photo above, the Bigfoot’s left arm is up near the face as if it is scratching its head wondering what the camera is. 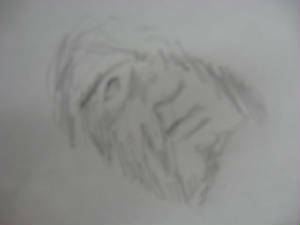 An artist's rendering of a the photo of the Bigfoot looking into the camera above. Drawing by Chris Gunter. Robert Lindsay continues to Revised Ketchum study tally, Ketchum DNA paper has definitely passed peer review. Justin Smeja Bigfoot steak is 90% human, and Adrian Erickson Bigfoot documentary project apparently being worked on in Hollywood. Read all these updates at Robert Lindsay's post, "Bigfoot News January 25, 2012"
Where is the pic of the tongue? I'm worried that there is no eyeshine in this photo, I would think you would see that from the angle of the eye to the camera as well as the closeness of the subject. I'm thinking it's something else. I'm not sure but eyeshine really depends on reflecting light and the angle in which it hits the eye. I am sure there was no flash. I'm not sure if infared can cause an eyeshine. I think these researchers and doctors are doing credible research. The finding of dna and knowing the source is a huge first step in cataloging individuals Sasquatchs. Plus researchers have a proven technique now, all they gotta to a smear something delicious on the trail cams. I suggest a mint and pinenut pesto lol. WOW, I've seen it all now! It's simply amazing how blurry photos can be cleaned up by so called Bigfoot DNA and determined that what we see in the blurry photo is a flesh and blood Bigfoot creature! It seems almost everyone new to this research has gone off the deep end. Just silly, everyone want to find proof of course but part of that needs to be recognising when you have nothing. There is nothing in that image that is close to worthwhile, sure it could be a bf, could be a porcupines belly or a bears armpit too. You cant have a "dna proven" picture when the picture is ambiguous at best. If someone was studying cougars and this was submitted as proof or even possible circumstantial evidence it would be instantly disregarded. Can I say 100% that it is not bf? No, but it shows nothing, proves nothing. how do you actually think you know when your jus sitting hear reading the arcticle, evidence and DNA not in hand, they are the ones working with tthe evidence and putting out the information, they are giving you what they have for now .. they are making great strides in this . MY LITTLE WEBCAM WOULDN'T TAKE AS LOUSY A SHOT AS THAT....WHO'R THEY TRYN TO MAKE FOOLS OF?? So for once we dont get bigfoot photos from 100 feet to a mile away...This time we get it from 2 feet and less and still a beep quality pic? If this is what you are going to bring us when its a perfect scenerio then dont bother. entertaining reading when i'm home sick with a cold. love the photos!